With NBA G League alum and current Brooklyn Nets point guard Spencer Dinwiddie taking the big stage at the NBA All-Star Taco Bell Skills Competition, let’s take a look back at his basketball journey. Spencer Dinwiddie #25 of the Colorado Buffaloes against the Oregon State Beavers during the first round of the Pac 12 Tournament at the MGM Grand Garden Arena on March 13, 2013. Dinwiddie played his college ball at Colorado, alongside current Delaware 87er Askia Booker. During their freshman seasons, Dinwiddie and Booker combined for 677 points, making school history by scoring over 250 points each. Led by Dinwiddie, Colorado won the Pac-12 Conference Tournament that season and earned its first NCAA Tournament berth since 2003. Ranked third among all freshman in the country in free throw percentage (81.6 percent), Dinwiddie was named to the Pac-12 All-Freshman team alongside Washington freshman and current Rio Grande Valley Viper Tony Wroten. During his sophomore season, Dinwiddie led the team in assists (99), as they reached the NCAA Tournament for the second-straight year, this time advancing to the second round. This made it the first time Colorado made the big dance two seasons in a row since 1963. After a productive freshman season as a duo, Dinwiddie and Booker became the highest scoring sophomore tandem in school history (915 points). On Feb.10, 2013, Dinwiddie broke a school record for the most points (24) scored without missing a shot when he finished a perfect 6-for-6 from the field (4-for-4 from 3) and 8-for-8 from the free-throw line in a win over Oregon State. During his junior year, Dinwiddie was a part of a Colorado team that won 14 of its first 16 games to start the season, highlighted by an upset over then-No. 6 Kansas on Booker’s game-winner. Dinwiddie became the leader of the team early on in the season, but on Jan. 12, 2014, he suffered a career-threatening ACL injury against Washington, and had to sit out for the remainder of the season. On April 24, 2014, Dinwiddie declared for the NBA Draft. 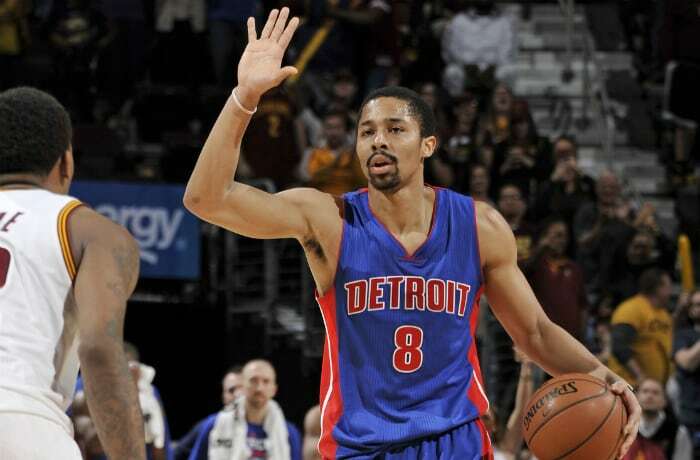 Spencer Dinwiddie #8 of the Detroit Pistons calls a play against the Cleveland Cavaliers on April 13, 2016 at Quicken Loans Arena in Cleveland, Ohio. On July 21, 2014, Dinwiddie signed a three-year deal with the Detroit Pistons after the club selected him 38th overall in the 2014 NBA Draft. He made his NBA debut on Oct. 29, 2014 against the Denver Nuggets, playing seven minutes and contributing an assist. He earned his first career start on Feb. 20, 2015 against the Chicago Bulls, where he neared a double-double, finishing with 12 points and nine assists. 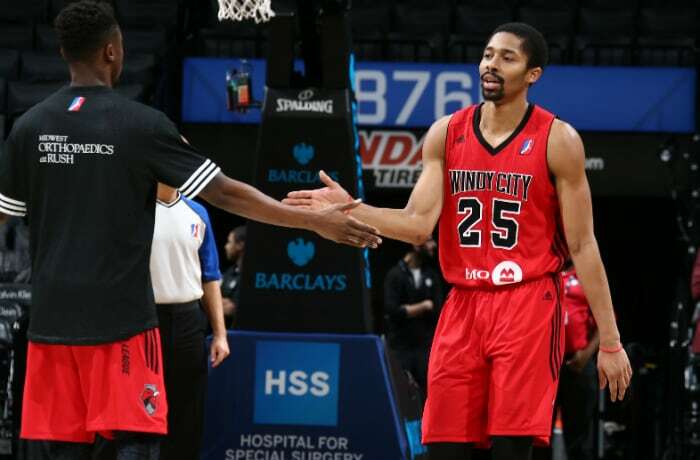 Dinwiddie was sent to the Grand Rapids Drive on assignment several times over his first two years, when he gained his first experiences in the NBA G League. On Jan. 30, 2016, Dinwiddie dropped an NBA G League career-high 28 points on 9-for-13 (69.2 percent) from the field. Spencer Dinwiddie #25 of the Chicago Bulls handles the ball against the Milwaukee Bucks on October 15, 2016 at the BMO Harris Bradley Center in Milwaukee, Wisconsin. On June 17, 2016, Dinwiddie was traded to the Chicago Bulls. He was waived by the Bulls on July 7, 2016, but then signed again with the team on July 28, 2016. After playing in the preseason with the Bulls, he was then waived again by the team on Oct. 21, 2016. Spencer Dinwiddie #25 of the Windy City Bulls high fives his teammate during an NBA G League game between the Windy City Bulls and the Long Island Nets on November 29, 2016 at Barclays Center in Brooklyn, NY. 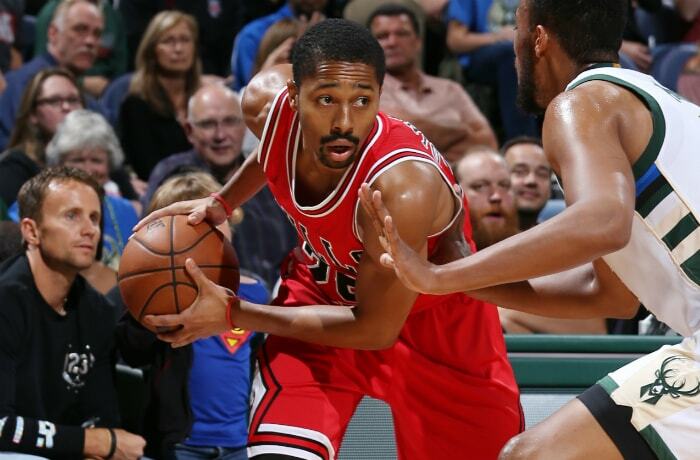 After being waived by the Chicago Bulls, Dinwiddie was acquired by the Windy City Bulls of the NBA G League on Oct. 30, 2016. In nine games, he averaged 19.4 points, 8.1 assists and 3.7 rebounds. He posted a season-high 25 points two straight games, leading to his opportunity with the Brooklyn Nets. Spencer Dinwiddie #8 of the Brooklyn Nets looks down the court against the New Orleans Pelicans during their game at Barclays Center on February 10, 2018 in the Brooklyn borough of New York City. On Dec. 8, 2016, Dinwiddie earned a Gatorade Call-Up to the Brooklyn Nets. He made his Nets debut just two days later, registering six points, two assists and a rebound in 10 minutes on the floor. 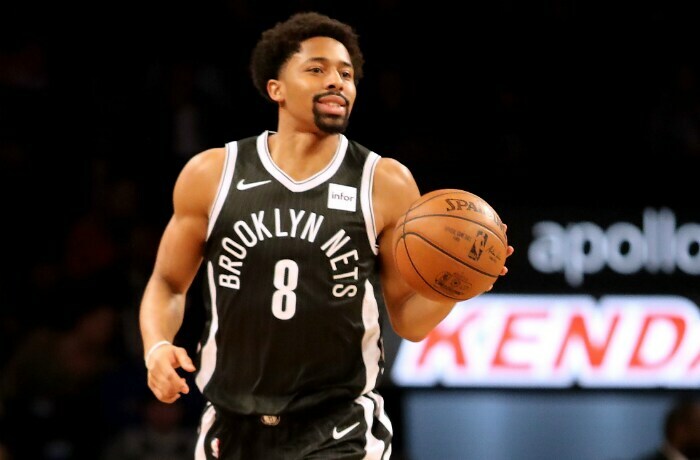 With early season injuries to NBA G League alum Jeremy Lin and Nets starting point guard D’Angelo Russell, Dinwiddie got his opportunity with the Nets and has taken full advantage of it. On Oct. 25, 2017, Dinwiddie scored a then-career-high 22 points and hit the go-ahead triple from deep range with 43 seconds left to beat the Cleveland Cavaliers, 112-107. Just four days later, he tied that then-career-high (22) against the Denver Nuggets. On Nov. 17, he set a new career-high in points, as he went off for 25 in a 118-107 win over the Utah Jazz. Dinwiddie dished out a career-best 12 assists in the 103-98 victory over the Washington Wizards on Dec. 12 as well, and then out-did himself with 26 points against the New York Knicks on Dec. 14. Dinwiddie continued his hot start to the season on Dec. 23, as he scored 26 points again in a close overtime loss to the Indiana Pacers. Dinwiddie rang in the new year quickly with 26 points and the go-ahead shot with 10.1 seconds left in a Nets 98-97 victory over the Minnesota Timberwolves on Jan. 3, 2018. But just five days later, he dropped 31 points (his current career mark) against the Toronto Raptors. On Jan. 12, he almost notched his first career triple-double, going for 20 points, 10 assists and nine rebounds in a 110-105 Nets win over the Atlanta Hawks. Dinwiddie, who is having by far the best season of his career, has been selected to represent the Brooklyn Nets at the 2018 NBA All-Star weekend when he competes in the Taco Bell Skills Challenge at All-Star Saturday Night (8 PM ET).